You exceeded any expectations that I had. You made sure the lines of communication were always open and were super knowledgeable. Your professionalism impressed me the most. I hope the Holiday Season has treated you and yours well. With the benefit of hindsight, it’s now clear that the lifetime floor in interest rates was set between October 2012 and April 2013. Mortgage interest rates are roughly a full 1% higher now than they were a year ago. The Federal Reserve is finally beginning to ease off their QE (quantitative easing) gas pedal, which will put additional upward pressure on mortgage rates. The FHFA (Federal Housing Finance Agency) Fannie Mae and Freddie Mac’s regulator and conservator has imposed additional Guaranty Fees, known as Loan Level Pricing Adjustments (LLPA’s) upon Fannie Mae and Freddie Mac that will be pushed on to lenders that sell loans to them (everyone basically) and thus, to you, the borrower. After over a decade in the mortgage business, I’m starting my own company, EZ Mortgages with our first office in Placerville, CA, close to my home in Somerset. I’m in the final stages of the regulatory process and I expect to be “open” at the new location in a few weeks. The transition will be seamless. You won’t notice anything different in working with me, other than my new company name says what you’ve been telling me – that I make real estate financing easy for you. My new contact information is at the end of this letter. As you can see, it appears that we’re on our way back up from the floor set between October 2012 and April 2013. Granted, it won’t be in a straight line. Additionally, it’s possible – although I’d say unlikely – that we’ll hit another significant economic shock and rates will trend down again. After all, looking at this graph, we can see several occasions where rates appeared to bottom, started rising, only to fall to new lows each time. The key distinction now, however, is that the catalyst for rates finding their lifetime floor was the most severe economic shock since the Great Depression. That precipitated the most severe deleveraging cycle the world has ever seen. That wasn’t the case in any of the prior “head fakes” with rates. How high will they go from here, and how fast will that happen? Nobody knows. I don’t see double digit interest rates in our future. I like to believe that the economic policy makers have a better grip on things now, than they had 40 years ago. But…only time will tell. There are certainly those who feel that the monetary policy of the last four or five years has already stoked the inflationary fires and the piper will come calling soon. I’m not in that camp. There are others who crow that our national debt is a ticking time bomb, and at some point, the bond market vigilantes – whoever they may be – will demand significantly greater returns, via higher rates, for the perceived risk of parking their money into US Treasuries and Mortgage Backed Securities. However, despite a “do nothing” Congress that can’t seem to come to any compromise for the good of our country, our Federal Deficit has been reduced from 10% of GDP just four years ago, to 4% now. Imagine what they could do if they actually worked together. But, that’s another story. We still have a long way to go, and our Deficit is only a component of our National Debt, but the trend is at least heading in the right direction for the first time, in a long time. I also don’t see rates rising too far, too fast. 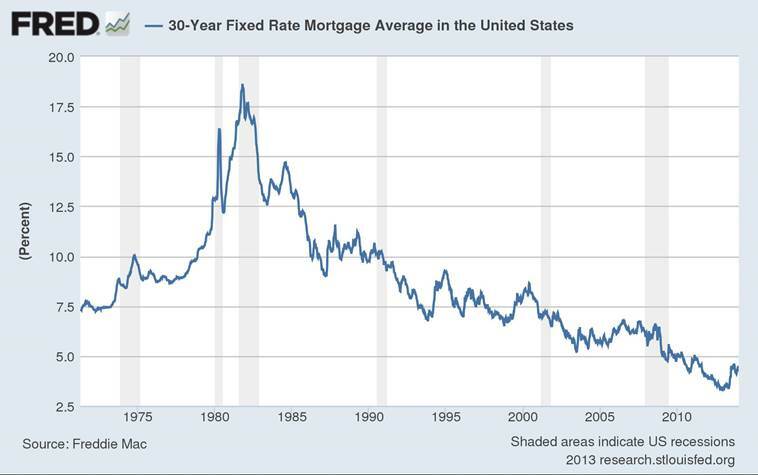 In my estimation, I’d think rates by the end of 2014 will be in the 5% to 5.5% range, roughly .5% higher than where we stand now, for 30yr fixed mortgages. I’d expect to see a similar increase in 2015. In general, a .5% rise in rates, equates to about a 5% shift in monthly payment. In most cases, although that rise is not ideal, it’s not a deal-breaker in a decision to buy a home, either. After all, people were still buying homes when rates were in the double digits. Another, equally important push on rising rates is the new Loan Level Pricing Adjustment that is being imposed by the FHFA through Fannie Mae and Freddie Mac. In short, what they’re doing is taking the “gold” standard of credit quality from a score of 740 (up from 720 prior to 2008) all the way to 780. Additionally, they’re imposing greater fees on borrowers with smaller down payments or percentage of equity in a refinance. For borrowers with a 740 fico, financing a home with 5% to 19.9% down payment, or equity in a refi, the new LLPAs will create an incremental cost of 1.25% for the same rate. That means for a $300,000 loan, you’ll have to pay $3750 more than current costs for the same rate. For borrowers with a 740 fico with 20% down, or equity in a refi, the pricing adjustment will be .5%, or $1500 on a $300,000 loan, for the same rate as today. Borrowers will have the option, as they do now, of paying those extra costs with cash, or shifting to a slightly higher rate, to absorb the incremental cost. These pricing adjustments are required for any loans purchased by Fannie Mae or Freddie Mac after April 1, 2014. Since most loans are originated and locked 30 days prior to closing/funding, but some are originated and locked further out, that means lenders will begin adding those pricing adjustments to their rate sheets towards the end of January, with them fully in place by the end of February and early March, so lenders don’t have to make up the difference upon sale to Fannie Mae or Freddie Mac. The FHFA is imposing these additional Guaranty Fees or Loan Level Pricing Adjustments for a couple primary reasons. They’re trying to raise more revenue for Fannie Mae and Freddie Mac, which are still clawing back to profitability after our taxpayer bail-out (one recent fee increase was actually used by Congress to cover the costs the temporary tax breaks during the market meltdown), and they’d like to move mortgage pricing closer to the level they’d expect to see in a robust private market. It’ll be interesting to see what impact this has on peoples’ intentions to buy a home, the housing industry and the mortgage markets in general. After all, if Congress and the FHFA would like to see a more “normal” mortgage market in the United States, that isn’t dominated by the Government Sponsored Enterprises (Fannie Mae and Freddie Mac) maybe they should consider that the United States is the only country on the planet to offer 30yr fixed mortgages. So…how “normal” is our mortgage market, really, anyway? ARMs, the supposed bane of our mortgage market are the norm in every other country across the globe, because they allow lenders to better hedge against future rate shifts. This ties right into the ongoing discussions of what to do with Fannie Mae, Freddie Mac, and our evolving mortgage market. I expect we’ll learn more about this over the next year or two. There are a variety of plans being floated now, none of which seem to have gained much traction. And, the further removed we are from the mortgage market meltdown, the easier it is to forget about the impetus for change. I’ll do my best to keep you posted as this evolves. Any changes that do happen could have major impact on how homes are financed in the US. Again, I really don’t expect too many wholesale changes. But? You never know. Time will tell.